North Carolina’s local and regional food system includes the production of apples, blackberries, blueberries, figs, kiwifruit, muscadine grapes, pecans, peaches, nectarines, raspberries and strawberries. Through the N.C. Cooperative Extension program fruit specialist and agents provide research-based information, educational programs and developments throughout the state regarding the production of small fruits, tree fruits and niche crops. The primary goals are to add value, enhance profitability, management strategies through local production and marketing for homeowners, fruit producers and processing industry. Successful fruit growth is highly dependent on practicing proper production techniques, soil nutrition, pest and disease management, training and pruning. Through NC State University research, many new horticultural crops have been introduced or developed with genetic resistance to pest, disease, heat tolerance, drought and freeze damage. 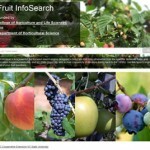 This powerful search engine is focused on fruit crop information from association websites, scientific literature, trade magazines and NC State University archives and repositories. Simply enter your fruit related question and find answers! The Small Fruit Program’s helps North Carolina and Southeastern farmers grow bunch grapes, muscadine grapes, strawberries, raspberries, blackberries and blueberries. See how you can optimize production through varietal selection, pruning and training, pest management and post harvest handling. North Carolina ranks in the top 10 nationally for peach, apple and pecan production. Explore successful grower solutions to orchard management, rootstocks, tree density, herbacides, common practices and frequent challenges. Food awareness and consumption is the best strategy in maintaining a healthy community. Unfortunately, fresh fruit and vegetables have sickened many people and have been linked to several outbreaks since 1990. Prevent foodborne illness and contamination through our practical suggestions. Please read our handbook on Food Safety for School + Community Gardens. • What's Eating Your Tree?